As I read the paper this morning, in dawned on me that there might be a number of folks wondereing just what birds DID we see at the new wetlands project!! I spent an evening this past February, walking and enjoying the site. The next morning Leon Lesicka spearheaded a huge endeavor to plant native vegetation in the ponds. Numerous bus loads of students from several local schools had lots of fun playing in the mud! Me too! The following was my original post to inlandcountybirds and following that is my eBird report from that little evening walk. Spent a good part of my weekend at a NEW wetlands site in the Imperial Valley and I invite all to come and visit! This newly created pond and wetlands system along the Alamo River is the third project of the Alamo / New River Wetland Projects. Located approximately three miles east of Brawley, the project is on the east bank of the Alamo River, one mile west of Hwy 115 at the end of O Brien Road. 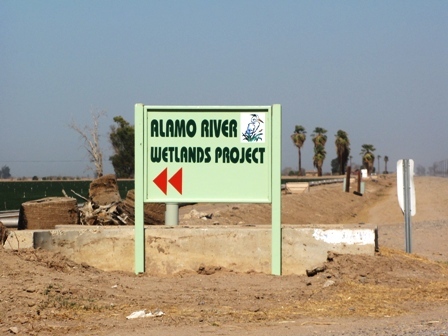 It is known locally as the Shank Road Wetlands because of its location near Shank Road and because it is the first of several projects that will occur along the Alamo River. Access to the site is from Hwy 115 on O Brien Road which is .5 miles south of Shank Road or 1.25 miles north of the intersection of Hwy 78. Saturday morning I was one of approximately 300 volunteers, moslty students from local schools (I think there were six or more school busses!) to assist in planting bullrushes for the project. Similar to the Imperial and Brawley sites of the New River Wetlands Project, water will flow through progressive ponds divided by barriers of vegetation to send cleaner water on to the Salton Sea. I have created a new site on eBird for the location and encourage all to please enter your observations on that same marker. This is a great opportunity for all of us to contribute to the bird database from the start of the project! Comments: This newly created pond and wetlands system along the Alamo River is the third project of the Alamo / New River Wetland Projects. Located approximately three miles east of Brawley, the project is on the east bank of the Alamo River, one mile west of Hwy 115 at the end of O Brien Road. It is known locally as the Shank Road Wetlands because of its location near Shank Road and because it is the first of several projects that will occur along the Alamo River. Access to the site is from Hwy 115 on O Brien Road which is .5 miles south of Shank Road or 1.25 miles north of the intersection of Hwy 78. A lone Coyote and several Rio Grande Leopard Frog were some of the other creatures noted on my first visit.